Education is a voyage; the arts are our guide. When is my time in history? How do I reflect on these questions? How do I share my reflections with the world? 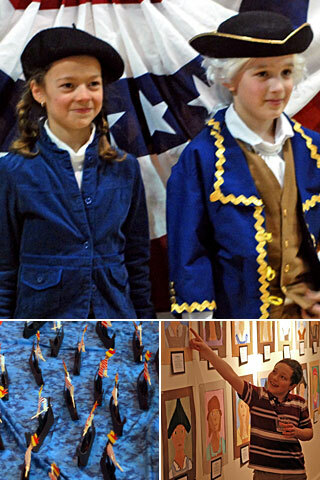 These essential questions are the foundation of artsVOYAGE, an innovative arts-in-education program created by Spencertown Academy Arts Center and presented in area public schools including the Chatham Central School District, Ichabod Crane Primary School in Valatie, NY, and Walter B. Howard Elementary School, New Lebanon, NY. Conceived as a way to use the arts to enhance and enliven existing classroom curriculum, artsVOYAGE has demonstrated the potential of the arts to enrich teaching and deepen earning across the curriculum in elementary/middle grades. Building on the curricular scaffold currently in place for Grades 2-8, artsVOYAGE infuses individual units of study with a range of exposures to visual arts, theater, dance, architecture, music, poetry, and expressive writing. The program weaves rich artistic experiences into the school day and helps students develop and explore their own creativity in a variety of art-making projects from portrait painting to choreography. Engaging in the same creative processes as people of other times and other places, students develop an empathy with the unfamiliar. Reflecting on these processes, students gain not only a set of tools for lifelong investigation, but also new means of self-expression. Students are exposed to excellence in all aspects of the arts, and exposure to excellence encourages excellent work in response. artsVOYAGE equates the creative process with academic rigor. In learning, as in creating, the student constantly synthesizes new learning, applying the discoveries made in one area to an increased understanding of another.